I really enjoy Blogging. So why haven't I posted anything for the past week? Well, I've been busy doing work on a project I am developing for my students. The project is about writing Blogs and using the Internet to help my form 2 students learn English. The site I am using for the students Blogs, Classblogmeister, is a pretty simple, basic site. Not everything is laid out for you, so knowing how to do some simple HTML coding helps to get the best out of the site. The great advantage of the site is that the teacher, in this case me, can have complete control over everything published. You can have as little or as much control over things as you want, or your administration requires. In my case, they want me to have complete control over everything that gets posted to the site. Fair enough. Whenever a student writes something and wants to publish it, it gets sent to my e-mail account for review first. Once I read it, I can either publish it, or send it back to the student with an explanation and/or asking that corrections be made. Even comments can be moderated, so that they don't write nasty things about each other on their Blogs, which I know is just what they would do. I have been experimenting with our class Blog. Right now the site is a mess, I know. I have been putting all sorts of things there, because I am experimenting and trying to see how things work. Not everything that is up there now will stay there. Some things are there because I needed to try out certain sites, to see how they worked, and whether they would work with the classblogmeister site. For example, my first attempt at podcasting. I made my first attempt at podcasting with my boss, Mr. Wong Teck Ee. He's got a great name for someone interested in the latest technology. He's also a great guy. We spent a couple hours on Friday, playing around with the Audacity software, and recording a test podcast. The Audacity recording software is pretty simple to use, but you can also spend hours playing around with all the gadgets and extras if you want. It's a great piece of software to use if you want to do podcasting, or do some recordings for your classes. As for where I am storing my podcasts, I am using Gcast. It is a really simple way to upload a podcast and put it on your Blog. 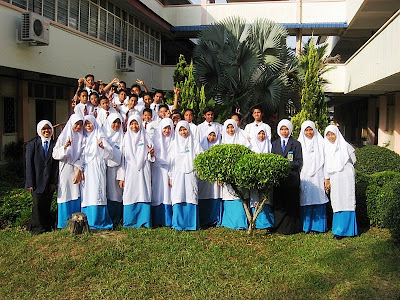 With my form 2 students, the simpler, the better. I also posted a video of our sports day, on Vimeo. It is also a pretty simple way to upload video and put it on the class blog. It is simple and fairly painless to use. There also a couple of slide showsI made on Bubbleshare, a spelling bee game for the kids to play, and a link to a YouTube video that we might be using later on. I also posted the first assignment for the kids to do, which is to look over what I think is one of the best examples of a class Blog I have seen. After they do that and get some ideas, I want them to write some ideas about what they want to do with our class Blog. I won't be too concerned with their grammar in the beginning. The idea is just to get them to start writing, and enjoy what they are doing. Later on I will be more strict on things like spelling, grammar, and organization. So that's what I was up to. Now it is semester break, and Trien and I are going to be running off to KL to our respective embassies. We have some business there that we have to take care of before the baby is born. If we don't there's going to be a mess of trouble later. Since she is in her second trimester, and feeling pretty good, we have to take care of it now. She might be unable to go with me later.